Creating a segmented a giclee installation brings an extra dimension of cool to your image. The above image is such an example. 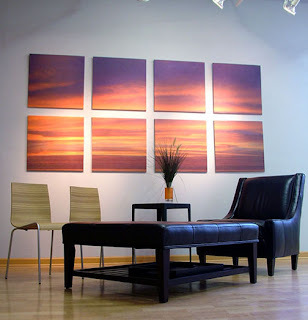 This digitally painted sunset image creates an installation that is 8 feet wide x 4 feet tall in full, each of the 8 segments are 2' x 2'. The segmented giclee installation is appealing for the simple fact that it slightly abstracts the content of the artwork by creating multiple exaggerated fields of interest, essentially creating eight works of art out of one original. This is an ideal treatment to add more visual interest to static images. Along those lines, a clever way to extend artwork along a long hall or large wall with smaller yet impacting pieces, truly stretching your dollar. Another benefit of a giclee installation is that it allows you to have a large display, free from our typical shipping constraints. As a rule, the largest giclee we can ship in a single piece is 48" x 60", or 4' x 5'. Anything larger has to be shipped freight, which isn't custom artwork's preferred shipping method. Creating the look in smaller segments allows for as large of an installation as you'd like. It is certainly much more achievable to ship 4 giclee sections that are 2.5' x 2.5' than shipping a full 10' x 10'. Frankly, that's not even possible without a wide load truck in front. Dig up the image you'd like transformed into a segmented giclee installation, go to Great Wall Custom Covering's custom order page and follow the directions. In the comments line, include that you want your piece to be in sections, and we'll create a mock up of your image, showing you how it will look when segmented. Submit your order, and within two business weeks the giclee installation will be at your door, ready to make your wall great. I think segmented is also nice...almost like a picture with a continuation...to attract or distract the viewers attention.